Sounds very good with all the spices. Found your blog from Donna's site. You have a very nice blog!!! 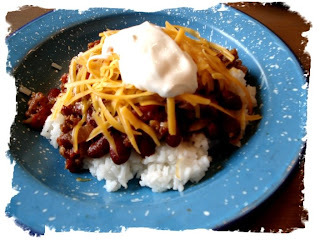 I have never had chili served over white rice... I must try it! This sounds wonderful. BTW, I blogged about your big macs on my website.. come read. This looks soooo good, thank you for sharing! Just stopped by to see what you were up to and say HI! How come it's Barack Obama chili? Looks deliciouso!